The school is committed to the exploration of cadets through an exhaustive program, interesting instructions and envious standard of achievements. The curriculum is comprehensive and based on core subjects going beyond academic book knowledge but also facilitating development of concepts, ideas and skills.MCSK provides unique sports facilities and opportunities for co-curricular activities.This institution is administered by Bangladesh Army and supervised by the Area Commander, Jessore Area. If you want to apply for this job,you should submit your application within 31 December 2016. Khulna Military collegiate school (MCSK) job circular 2016 has been converted to an image file, so that everyone can read easily or download this job circular. 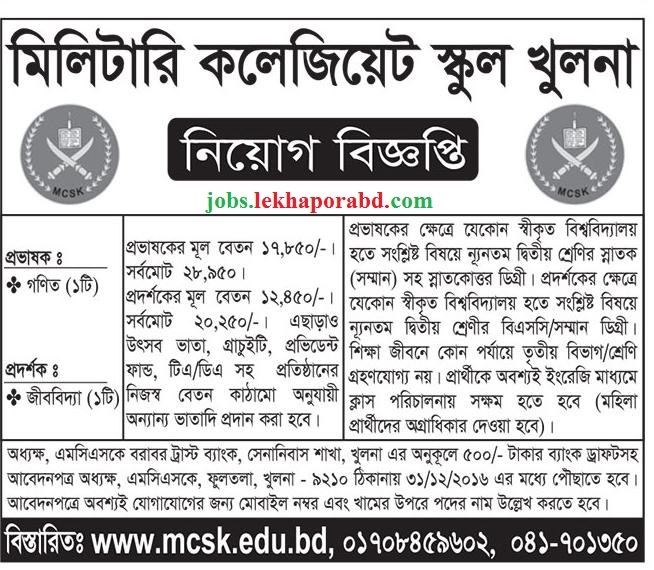 Khulna Military collegiate school (MCSK) job circular 2016 has been given bellow.